There are games that come to us instinctively and there are games that require blending these instincts with acquired skills. Such a game is soccer, as we start playing it with an instinct to kick the ball as hard as we can! BUT to keep it in control and synchronize the rules and tricks for us to move ahead and become good soccer players, we need to learn the theories and put them into practice on the field. What's the difference between soccer and football? Around 1860 soccer and football were more or less the same sport in the developed countries. When the “No hands” rule came into play, a game called rugby went one way and soccer went the other. * Europe and South America play football or Association football, which is the same as playing soccer. * US and Canada play soccer also, but their biggest game is Gridiron also called American football or Canadian football... which is a version of rugby and essentially involves passing, picking up and running with the ball. Their Super bowl games draw huge crowds. * UK, Australia, New Zealand and Pacific Islands play soccer and interchange the word soccer and football to mean the same game. They also have the popular game of rugby or rugby union, sometimes called rugby football, just to confuse things. * Other versions of rugby are rugby league and International Rules Football and Australian Rules Football - each of which are high contact, wilder sports than rugby, which is of course a high contact sport anyway! * The world governing body of soccer is FIFA, which stands for the International Federation of Association Football or more correctly in France, Fédération Internationale de Football Association. 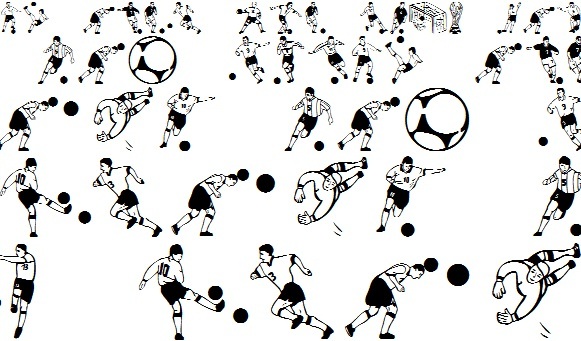 Soccer is played with a perfectly round or spherical ball. Football as played like rugby or similar, uses an oblong or oval ball with narrow ends. Rugby football requires the players to wear more protection than soccer players, whose basic outfits are soccer jerseys, shorts and shin guards. Rugby footballers often wear headgear to protect them from scrum injuries and gridiron player wear very heavily padded protection accessories. Both soccer and rugby players wear studded boots. Soccer allows only the goalkeeper to touch the ball in play with the hands; while in rugby football, it’s the punter (a person who kicks the football by dropping it from the hands and contacting it with the foot before it hits the ground) and the team players or kickers who kick the ball. Soccer also allows players to use their heads to play the ball. A coin is tossed to decide which team kicks off. Players stand in their own half, with the opposite team’s players outside the centre circle. The ball is kicked off forward and into play. A goal is not allowed to be scored directly from a kickoff. Once a goal is scored, the non-scoring side then kicks off from the centre again. There are two 45 minute sessions with a half-time break of approximately 5-10 minutes. A correct soccer game is played with two teams of 11 players per team. Of course 2 or more people can kick a soccer ball around anytime and make a game of it. Midfield players: These are busy guys! Covering and supporting, they try and control the mid section of the pitch and help in defence and attack. Midfield should be made up of a combination of players who can tackle and win the ball, pass accurately, play the ball with one touch, keep possession of the ball, and run, then run more. A midfield player should be able to guage the suitability of their fellow players for the game’s pace and be able to speed it up or slow it down accordingly. Defence: It helps to have players with a bit of height here, even one central defender who is good in the air. On either side of the goal there are fullbacks and their skill is in timing when to go in and attack, obtain possession of the ball and run with it for a good stretch or give it a decent long pass. A quick boot away out of the penalty area is not recommended - it will most likely be back again shortly, but on the other hand sometimes taking a chance or conceding a throw-in is the only thing to do, rather than risk losing a goal. Goalkeeper: The extreme position of defense is occupied by the goalkeeper. Attack: Often several forwards are positioned in the middle of the pitch with the midfield players or overlapping fullbacks taking the ball wide to knock in centres. A good combination in the centre is a tall player to win headers and a quick, smaller player to pick up the ball or ‘knock-downs’ and score. Good attackers have multiple skills honed from practice. They instinctively aim to score, so speed, balance, stamina, courage and strength are necessary. Heading ability and two good kicking feet round out an attacking soccer player. Linesmen and Referees: The referee of a soccer game does a lot of work. He or she has to run and keep up with the play at all times and make sure all players play fair and follow the rules. The ref’s job is to caution players, stop play, hold up a red or yellow card, award throw-ins and shoot-outs as necessary. The 2 linesmen are on opposite touch lines, hold red or yellow flags and determine when and where a ball has breached the touch line or goal line. They also keep time and signal when half and full time are up. Coaches, Managers and Captains: The coach of a soccer team is often the manager as well, although sometimes other helpers are enlisted to help manage a team by ensuring everyone knows where they are playing or practising, at what time, and all the gear is on hand, plus a host of other details to make things run smoothly. The actual coach of a team does the training, encouragement, tactics and team selections. The team captain is in charge on the field. The captain decides on kick-off or ends when the referee tosses the coin, and makes sure the team does its best by giving orders, encouragement and setting a good example. A soccer ball is round with a circumference up to 28”. Click to read Everything you wanted to know about soccer balls. Dimensions: 90-120 m long by 45-90 m wide (100-130 yards x 50-100 yards). Official international matches are played on fields 100-110 m by 64-75 m (110-120 yards x 70-80 yards). Soccer players wear studded boots, either with screw-in studs/cleats or moulded studs/cleats into the soles. Soccer jerseys in the teams colors, shorts and mandatory shinguards are also worn. Soccer involves two goals at each end of the soccer field; it is through pushing the ball into these goals the teams score. There are a variety of materials and sizes that these goals are made from. For portable goals there are lightweight, synthetic materials, while for permanent installations, iron and steel are preferred. For practice purposes the net stretching over the posts need to have a bouncy effect.